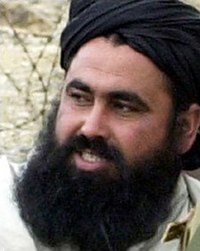 Baitullah Mehsud (Pashto,Urdu: بیت اللہ محسود‎); c. 1972 – c. 5 August 2009) was a leading militant in Waziristan, Pakistan, and the leader of the Tehrik-i-Taliban Pakistan (TTP). He formed the TTP from an alliance of about five militant groups in December 2007. He is thought by U.S. military analysts to have commanded up to 5,000 fighters and to have been behind numerous attacks in Pakistan including the assassination of Benazir Bhutto which he and others have denied. Disagreement exists over the exact date of the militant's death. Pakistani security officials initially announced that Baitullah Mehsud and his wife were killed on 5 August 2009 in a U.S. Central Intelligence Agency drone attack in the Zangar area of South Waziristan. Interior Minister Rehman Malik delayed giving official confirmation and asked for patience and an announcement by Inter Services Public Relations (ISPR) or other agencies. Kafayat Ullah, a TTP source, also announced the death of the militant in the strike, as did his deputy Faqir Mohammed. Later Tehrik-i-Taliban Pakistan commander Hakimullah Mehsud denied previous TTP announcements and said Mehsud was in good health. Major General Athar Abbas, ISPR spokesman, and Robert Gibbs of the White House said his death could not be confirmed, U.S. National Security Adviser James L. Jones also claimed that there was "pretty conclusive" evidence that proved Baitullah Mehsud had been killed and that he was 90% sure of it. On 23 August 2009, Hakimullah Mehsud and Wali-ur-Rehman telephoned the BBC to say that the Baitullah Mehsud had died on 23 August 2009 due to injuries sustained during the 5 August attack. On 30 September 2009, the BBC received a video that showed the body of Mehsud. Syed Saleem Shahzad, writing in the Asia Times, described Baitullah Mehsud as a physically small man, with diabetes. Baitullah Mehsud was born in the early 1970s in Landi Dhok village in the Bannu District of Khyber Pakhtunkhwa province of Pakistan, which lies some distance from the Mehsud tribe's base in the South Waziristan Agency. An ethnic Pashtun, he hailed from the Broomi Khel side of the Shabi Khel sub-clan of the Mehsud tribe, and was one of five brothers. He avoided media attention and refused to be photographed in adherence with his religious beliefs. He did not attend schooling or religious madrassa. He emerged as a major tribal leader soon after the 2004 death of Nek Mohammad. In a ceremony attended by five leading Taliban commanders, including Mullah Dadullah, Baitullah was appointed Mullah Omar's governor of the Mehsud area. After Nek Muhammad's death, Abdullah Mehsud and Baitullah Mehsud both vied for dominance of the Pakistani Taliban. When Abdullah died in a raid by Pakistani security forces and later his successor perished in a bomb explosion, Qari Zain and other members of Abdullah's faction suspected that Baitullah played a role in the attacks. The rivalry continued after Zainuddin obtained leadership of Abdullah's group. Abdullah Mehsud, a Taliban leader who was among the first captives set free from Guantanamo, has been described as Baitullah's brother. Other sources have asserted that they were clansmen or merely associates.Islam Online reports that Baitullah suspected that Abdullah was a double agent. Mehsud entered into a ceasefire with Pakistani authorities on 8 February 2005. During the meeting at Sara rogha, the Pakistani military agreed to withdraw its troops from areas under Baitullah's control. The removal did not include the paramilitary Frontier Corps, consisting mostly of fellow Pashtuns. In exchange, Baitullah's followers would not attack government officials, impede development projects or allow foreign militants to operate within their territory. Mehsud was offered US$20 million for his cooperation in the ceasefire. He declined the money and told Pakistani authorities that they should use the pay-out to "compensate families who had suffered during the military operation". The ceasefire agreement ended in July 2005 when after accusing the government of reneging on the deal, Baitullah resumed attacks on security forces. By 2006, Baitullah Mehsud's growing influence in South Waziristan led terrorism analysts to label him as "South Waziristan's Unofficial Amir". Baitullah's lashkar (army) is very organised. He has divided it into various units and assigned particular tasks to each unit. One of the units been tasked to kill people who are pro-government and pro-US or who support the US occupation of Afghanistan. The last person to be killed was Malik Arsallah Khan, chief of the Khuniakhel Wazir tribe, who was killed on 22 February in Wana (in South Waziristan). In June 2006 Taliban-aligned Waziri tribes began negotiating another ceasefire with Pakistani forces. In a January 2007 interview with the BBC Urdu Service, Baitullah extolled the virtues of jihad against foreigners and advocated taking the fight to the U.S. and to Britain. After the siege of Lal Masjid in July Baitullah turned his forces against the Pakistani state. In December 2007, Mehsud was declared the first leader of the Tehrik-i-Taliban Pakistan. In February 2008, Mehsud announced that he had agreed to another ceasefire with the government of Pakistan although the Pakistani military claimed that operations against Mehsud's forces continued. The New York Times, however, reported that anonymous high-level officials in the Pakistani government confirmed the deal. In April Baitullah circulated a pamphlet that ordered his followers not to undertake any attacks inside Pakistan due to ongoing peace talks. In July 2008, Baitullah issued a statement that threatened to take action against the Khyber Pakhtunkhwa government if it did not step down within five days. The NWFP parliamentary leaders promptly refused. Various news media sources reported the death of Baitullah Mehsud on 30 September 2008 at the age of 34 due to kidney failure. Many of his close associates, including his aide, his doctor and a Taliban spokesman, vehemently denied the rumors. According to the spokesman, Mehsud was "fit and well." Mehsud's doctor also said he had spoken with him after the rumors of his death. The rumors proved to be false. Mehsud entered a second marriage in November 2008. Mehsud's first wife bore his four daughters and he may have hoped his second wife, "the daughter of an influential cleric," Ikramuddin Mehsud, would bear him a son. In February 2009, senior Taliban leaders Baitullah Mehsud, Hafiz Gul Bahadur and Maulvi Nazir put aside their differences in an effort to refocus against a common enemy. Nazir had previously feuded with Baitullah for his sheltering of Uzbek militants whom Nazir had fought to evict from South Waziristan. As a result of the February agreement, Maulvi Nazir ended support for Qari Zainuddin Mehsud, who the Daily Times described as the "self-appointed successor of ... Abdullah Mehsud." Zainuddin's group then allied with a group led by another militant, Turkestan Bhittani. On 27 March 2009, Pakistan's Daily Times reported that Baitullah Mehsud's group was engaged in a dispute with Qari Zainuddin's group for control of South Waziristan. Both groups had distributed pamphlets leveling accusations against the other groups' leader. Qari Zainuddin stated that Baitullah's group was not practicing jihad because Islam forbids suicide attacks. Baitullah's pamphlet claimed that the slain Abdullah had been a government puppet and Qari Zainuddin was a traitor to Islam and to the Mehsud tribe. The rivalry culminated on 23 June 2009, when a gunman shot and killed Zainuddin in Dera Ismail Khan. The gunman had served as one of his bodyguards and after the incident was suspected to be Baitullah's agent. On 28 June 2009 the Pakistani government announced a reward of Rs.50,000,000 for information that leads to the capture, dead or alive, of Baitullah. The bounty coincided with a previous offer from the United States, which offered $5,000,000. On the night of 5 August 2009, while he was staying with his second wife at his father-in-law's house in Zangara, a U.S. drone attacked the premises. According to former CIA director Leon Panetta, he was observed on the roof of the house and identified by the distinctive hat he wore. According to The Times, it may have been his desire to father a son that ultimately led to his demise. Two of his followers, Maulana Meraj and Hakimullah Mehsud, denied the report the following day, dismissing it as "rumors" intended to negatively impact the Taliban's spread of jihad. They suggested that Baitullah had gone into hiding and isolation as a part of a strategy. Hakimullah added that meetings of Taliban officials in Dir and surroundings are proceeding as usual "to make worth of their abilities and to discuss other plans which he called 'war game plans'." These reports were followed by several telephone conversations between AP reporters with Qari Hussain, Maulvi Omar and Hakimullah Mehsud to deny Baitullah's death and to claim he had been ill, perhaps gravely, for several months or had been "busy on the battlefield." Hakimullah indicated that soon a videotape would be released as a proof of his statements. After his capture on 18 August, Maulvi Omar retracted his previous statements and confirmed that Baitullah had indeed perished in the missile strike. On 20 August, U.S. President Barack Obama stated "We took out [Baitullah] Mehsud" in a radio address. On 25 August, both Hakimullah Mehsud and Wali-ur-Rehman confirmed to BBC and AP correspondents that Baitullah had perished on 23 August from injuries sustained in the missile strike. The attack is part of the U.S. Central Intelligence Agency's (CIA) campaign using unmanned aerial vehicles in the region by the agency's Special Activities Division. U.S. missile strikes targeting Mehsud territory in South Waziristan became more common after June 2009 when Pakistan, while having been publicly critical of the missile strikes, declared a military offensive against Mehsud. A September 2007 report from the United Nations attributed almost 80% of suicide bombings in Pakistan to Baitullah. Pakistani officials traced an estimated 90% of suicide and militant attacks within Pakistan throughout the 2007–2009 period to his South Waziristan stronghold. Preliminary investigations concerning the September 2007 bombings in Rawalpindi note that Mehsud is the primary suspect behind the attacks. An 18 December 2005 report stated that Baitullah Mehsud, Abdullah Mehsud and Yaldeshev were the subject of a man-hunt. Authorities said they believed that the militants were short of ammunition and would be captured soon. On 28 December 2007 the Pakistan government claimed that it had strong evidence regarding Baitullah Mehsud as the man behind the assassination of former Prime Minister Benazir Bhutto on 27 December 2007. The Pakistani government released a transcript it asserted was from a conversation between Baitullah Mehsud and Maulvi Sahib (literally "Mr. Cleric"). According to the transcript Maulvi Sahib claimed credit for the attack, Baitullah Mehsud asked who carried it out, and was told, "There were Saeed, the second was Badarwala Bilal and Ikramullah was also there." The translation released from Agence France Presse differed slightly from the translation from the Associated Press. According to the transcripts Baitullah Mehsud says he is at, "Anwar Shah's house", in Makeen or Makin. The Agence France Presse transcript identifies Makeen as a town in South Waziristan. Subsequently, both Agence France Presse and NDTV released an official denial by Mehsud's spokesman in which he said that Mehsud had no involvement in the attack, that the transcript was "a drama", that it would have been "impossible" for militants to penetrate the security cordon around Bhutto, and that her death was a "tragedy" which had left Mehsud "shocked". Mehsud's spokesman was quoted as saying: "I strongly deny it. Tribal people have their own customs. We don't strike women." In an address to the nation on 2 January 2008, Pakistani President Pervez Musharraf said that he believed Maulana Fazlullah and Baitullah Mehsud were prime suspects in the assassination of Bhutto. On 18 January 2008, The Washington Post reported that the CIA has concluded that Mehsud was behind the Bhutto assassination. "Offering the most definitive public assessment by a U.S. intelligence official, Michael V. Hayden said Bhutto was killed by fighters allied with Mehsud, a tribal leader in northwestern Pakistan, with support from al-Qaeda's terrorist network." U.S. President George W. Bush then placed Mr. Mehsud on "a classified list of militant leaders whom the C.I.A. and American commandos were authorized to capture or kill." In telephone interviews with news media Mehsud claimed responsibility for the 30 March 2009 attack on the police training academy in Lahore. He told the BBC that the attack was in retaliation for continued missile strikes from American drones for which the Pakistani government shared responsibility. In the same interview Mehsud claimed two other attacks: a 25 March attack on an Islamabad police station and a 30 March suicide attack on a military convoy near Bannu. Although the FBI later completely refuted that he had any involvement in the incident, Mehsud claimed responsibility for the shootings in Binghamton, New York, on Friday 13 April, 2009. 13 people were killed in the shooting, after which the attacker committed suicide. In a telephone interview, Mehsud reportedly said: "I accept responsibility. They were my men. I gave them orders in reaction to US drone attacks." Mehsud made this claim despite the fact that the gunman in the shootings was alone and of Vietnamese nationality and had stated other motives in his last letter. ^ a b c "Taliban admit commander's death". BBC. 25 August 2009. Retrieved 25 August 2009. ^ Ayaz Gul (6 August 2009). "Pakistan Foreign Minister: Taliban Chief Baitullah Mehsud is Dead". Voice of America. Islamabad. Archived from the original on 7 August 2009. Retrieved 7 August 2009. ^ Hamid Shalizi; Peter Graff; Jeremy Laurence (7 August 2009). "Afghan Taliban say unhurt by Mehsud death". Reuters. Kabul. Retrieved 7 August 2009. ^ a b Tighe, Paul & Katz, Ian (10 August 2009). "Pakistan Challenges Taliban to Show Leader Mehsud Still Alive". Bloomberg L.P. Archived from the original on 20 July 2012. Retrieved 9 August 2009. ^ a b Masood, Salman (26 February 2008). "Blast Kills Surgeon General of Pakistani Army". New York Times. Archived from the original on 24 May 2013. Retrieved 26 August 2008. ^ a b Abbas, Hassan. "A Profile of Tehrik-i-Taliban Pakistan Archived 9 April 2016 at the Wayback Machine". CTC Sentinel 1 (2): 1–4. January 2008. ^ "Aide says Pakistani Taliban leader Mehsud is dead". Associated Press. 7 August 2009. Archived from the original on 10 August 2009. Retrieved 7 August 2009. ^ "Pakistan Taliban denies leader dead". Aljazeera. 8 August 2009. Archived from the original on 8 August 2009. Retrieved 7 August 2009. ^ "ISPR denies reports of Mehsud killing". Malayasia Sun. Midwest Radio Network. 7 August 2009. Archived from the original on 18 September 2009. Retrieved 7 August 2009. ^ "White House declines to confirm death of Taliban chief in Pakistan". Xinhua. 8 August 2009. Retrieved 7 August 2009. ^ a b Subler, Jason; Graham, Patrick & Haider, Kamran (9 August 2009). "UPDATE 3-US says evidence Taliban chief dead "pretty conclusive"". Reuters. Thompson Reuters. Retrieved 9 August 2009. ^ "Taliban film shows leader is dead". BBC. 30 September 2009. Retrieved 26 April 2010. ^ Syed Saleem Shahzad (8 August 2009). "Baitullah: Dead or alive, his battle rages". Asia Times. Archived from the original on 7 August 2009. Retrieved 7 August 2009. Over the past few years, the small, diabetic yet hugely charismatic Baitullah has established himself and his TTP, a militant umbrella group primarily in conflict with the central government, in South Waziristan and beyond. Many view him as a bigger threat than al-Qaeda leader Osama bin Laden. ^ a b "Pakistan's most wanted: Baitullah Mehsud". Jane's Information Group. 12 February 2008. Retrieved 19 December 2008. ^ a b c Nasir, Sohail Abdul (9 July 2006). "Baitullah Mehsud: South Waziristan's Unofficial Amir". Terrorism Focus. 3 (26). Archived from the original on 3 September 2014. Retrieved 29 December 2008. ^ a b Shehzad, Mohammad (10 March 2006). "Why is the Pakistan army scared of this man?". rediff. Archived from the original on 16 December 2007. Retrieved 29 December 2007. ^ a b c Khan, Mukhtar A. (2 July 2009). "A Profile of the Late Qari Zainuddin Mahsud –Waziristan Militant and Opponent of Baitullah Mahsud" (PDF). Terrorism Monitor. Washington, DC: The Jamestown Foundation. 7 (19): 5–6. Archived from the original (PDF) on 5 June 2011. Retrieved 8 July 2009. ^ "Former Guantanamo inmate blows himself up in Pakistan". Dawn. 24 July 2007. Archived from the original on 7 October 2008. Retrieved 3 March 2008. During Mehsud's time on the run, his brother Baitullah had taken over from him as one of the top Taliban commanders in Pakistan's tribal regions. ^ Bill Roggio (24 July 2007). "Pakistani Taliban commander Abdullah Mehsud killed during raid". Longwar Journal. Retrieved 3 March 2008. Abdullah Mehsud, born Noor Alam, was a member of the Mehsud clan in South Waziristan, and was a clansman of Baitullah Mehsud, the most powerful commander in the tribal agency. ^ Saleem Shahid (25 July 2007). "Cornered militant blows himself up". Dawn (newspaper). Archived from the original on 12 March 2008. Retrieved 3 March 2008. Security was beefed up in Zhob and on Balochistan’s border with Waziristan after the killing of Abdullah Mehsud, the most important Taliban commander in the country after Baitullah Mehsud. ^ Aamir Latif (29 January 2008). "Pakistan's Most Wanted". Islam Online. Archived from the original on 31 March 2008. Retrieved 2008-03-03. ^ Iqbal Khattak (30 January 2005). "Baitullah Mehsud gets ready to surrender". Daily Times. Archived from the original on 4 January 2008. Retrieved 29 December 2007. ^ Iqbal Khattak (8 February 2005). "Baitullah Mehsud and 35 others get government amnesty". Daily Times. Archived from the original on 29 May 2006. Retrieved 29 December 2007. ^ Shamim Shahid (8 February 2005). "Baitullah, supporters lay down arms". The Nation. Archived from the original on 6 November 2007. Retrieved 29 December 2007. ^ Ismail Khan (9 February 2005). "Pakistan paid militants to surrender: Money used to repay Al-Qaida debt". The Tribune. Archived from the original on 31 December 2007. Retrieved 29 December 2007. ^ a b Gall, Carlotta; Ismail Khan (12 February 2008). "In Pakistan, Doubts Over the Fight in Tribal Areas". The New York Times. Retrieved 12 February 2008. ^ "Forces, militants heading for truce". Ariana Afghanistan WorldWide Broadcasting. 23 June 2006. Archived from the original on 27 September 2007. Retrieved 2007-12-29. ^ Rashid, Haroon (29 January 2007). "Pakistan Taleban vow more violence". BBC News. Archived from the original on 28 December 2008. Retrieved 29 December 2008. ^ a b Moreau, Ron; Sami Yousafzai (7 August 2009). "The End of Al Qaeda?". Newsweek. Archived from the original on 11 August 2009. Retrieved 7 August 2009. ^ Khan, Anwarullah (18 July 2008). "Baitullah's 'five-day ultimatum' to NWFP government". Dawn News. Archived from the original on 22 August 2008. Retrieved 23 January 2009. ^ "NWFP govt. will not resign: Bashir Bilour". Dawn News. 18 July 2008. Archived from the original on 16 February 2009. Retrieved 2009-01-23. ^ "Sources: Man blamed for Bhutto killing is dead". CNN. 1 October 2008. Retrieved 30 July 2009. ^ "Baitullah Mehsud dies". Geo Television. 1 October 2008. Archived from the original on 3 October 2008. Retrieved 1 October 2008. ^ "Top Pakistan militant 'not dead'". BBC. 1 October 2008. Archived from the original on 2 October 2008. Retrieved 1 October 2008. ^ "Desire for son led to Baitullah Mehsud's death: Report". Times of India. 8 August 2009. Archived from the original on 9 August 2009. ^ "Frau von Pakistans Taliban-Chef bei Angriff getötet" (in German). Reuters. 5 August 2009. ^ a b c "Taliban groups fight for local support in South Waziristan". Daily Times (Pakistan). 27 March 2009. Archived from the original on 4 April 2009. Retrieved 27 March 2009. ^ Bitani, Alamgir (23 June 2009). "Guard kills rival to Pakistan Taliban leader Mehsud". Yahoo! News. Archived from the original on 25 June 2009. Retrieved 2009-06-23. ^ Masood, Salman; Pir Zubair Shah (23 June 2009). "Rival of Pakistan Taliban Leader Is Assassinated". New York Times. Archived from the original on 1 October 2010. Retrieved 23 June 2009. ^ "Govt offers Rs50 million reward for Baitullah: officials". Dawn Media Group. 28 June 2009. Archived from the original on 17 July 2009. Retrieved 30 June 2009. ^ Panetta, Leon (2014). Worthy Fights. Penguin Press. p. 237. ISBN 978-1-59420-596-5. ^ Rupert, James & Qayum, Khalid (10 August 2009). "Taliban Deny Pakistani Report They Are Fighting Over Leadership". Bloomberg L.P. Archived from the original on 23 January 2009. Retrieved 10 August 2009. ^ "Baitullah Mehsud is alive, claims Hakeemullah Mehsud". Geo News. 8 August 2009. Archived from the original on 11 August 2009. Retrieved 8 August 2009. ^ Ahmad, Munir (18 August 2009). "Forces Capture Pakistani Taliban's Top Spokesman". Islamabad: ABC News. Archived from the original on 19 August 2009. Retrieved 18 August 2009. ^ "Obama: "We took out" Pakistani Taliban chief". Reuters. 20 August 2009. ^ "Pakistani Taliban admit Mehsud killed in US strike". Dawn News. 25 August 2009. Archived from the original on 28 August 2009. Retrieved 25 August 2009. ^ Mark Mazzetti; Eric P. Schmitt (6 August 2009). "C.I.A. Missile Strike May Have Killed Pakistan's Taliban Leader, Officials Say". The New York Times. Retrieved 9 August 2009. ^ "'Drone attack' kills Taliban wife". BBC News. 5 August 2009. Archived from the original on 5 August 2009. Retrieved 5 August 2009. ^ Ali, Imtiaz (9 July 2009). "Commander of the Faithful". Foreign Policy. Archived from the original on 11 October 2009. Retrieved 13 July 2009. ^ Qudssia Akhlaque (18 December 2004). "Hunt launched for key ultras". The Tribune. Archived from the original on 24 January 2008. Retrieved 29 December 2007. ^ Gale, Carlotta (28 December 2007). "Bhutto Buried as Government Orders Virtual Lockdown". The New York Times. Retrieved 28 December 2007. ^ a b "Transcript of Alleged al-Qaida Intercept". Associated Press. 28 December 2007. Archived from the original on 31 December 2007. Retrieved 2007-12-29. ^ a b "Transcript: Alleged Al Qaeda Conversation Regarding Bhutto Killing". Fox News. 28 December 2007. Archived from the original on 31 December 2007. Retrieved 29 December 2007. ^ a b "Pakistan releases al-Qaeda call text". NDTV. 28 December 2007. Archived from the original on 1 January 2008. Retrieved 29 December 2007. ^ "Mehsud denies killing Bhutto: Al-Qaida". NDTV. 29 December 2007. Archived from the original on 1 January 2008. Retrieved 29 December 2007. ^ "Al Qaeda militant did not strike Bhutto: spokesman". Australian Broadcasting Corporation. 29 December 2007. Archived from the original on 1 January 2008. Retrieved 31 December 2007. ^ Warrick, Joby (18 January 2008). "CIA Places Blame for Bhutto Assassination". Washington Post. Retrieved 19 January 2008. ^ Mazzetti, Mark; Sanger, David E. (21 February 2009). "Obama Widens Missile Strikes Inside Pakistan". New York Times. Archived from the original on 9 April 2009. Retrieved 21 February 2009. ^ a b "Lahore 'was Pakistan Taleban op'". BBC News. 31 March 2009. Archived from the original on 1 April 2009. Retrieved 31 March 2009. ^ Ali, Mohammad Faisal (31 March 2009). "Baitullah claims responsibility for Manawan attack". Dawn Media Group. Archived from the original on 4 August 2010. Retrieved 31 March 2009. ^ "Pakistani Taliban chief claims U.S. shooting". Reuters. 4 April 2009. Archived from the original on 8 April 2009. Retrieved 4 April 2009. ^ Moore, Tina (4 April 2009). "Pakistani Taliban leader claims responsibility for Binghamton shooting; authorities quickly refute". Daily News. New York. Archived from the original on 4 June 2011.